There are several things that combine to create my variation of 'a perfect day' and yesterday was full of them. 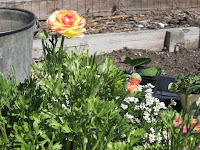 I spent a few hours at my garden plot weeding and planting. 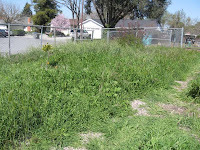 The rainy weather we have been having here in Northern California gave way to warm sunshine which really makes weeds grow tall fast. 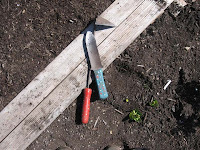 This is the site I was greeted with upon arriving at the community garden. It is still there because I didn't tackle it yet and I think this mess is a community project waiting to happen, let's hope we don't wait much longer. I did however, tackle similar weeds growing in the paths around my plot. Surprisingly though my plot didn't have many weeds growing because I have been keeping them up before they could go to seed. That is the trick to weeding folks...DON'T LET THE WEEDS GO TO SEED. Sounds simple, but it's not. So I pull out my handy weeding tools, both of which I bought years ago at Smith and Hawkin back when they got tools from Japan and not China or Vietnam. They are so nicely made and have stood up to lots of use. I painted the handles with some fun colors to help me keep from loosing them. Besides weeding I managed to do a little planting. No tomatoes yet, but I did add some flowering sweet pea starts. I am trying a new to me variety called 'Barry Dare' they are scarlet, double petals and ruffly, at least that was the description, I can't wait to see them. I planted some Sugar Snap Peas because I love to eat them while I am at the garden working and I plan to be there a whole lot more in the months to come. 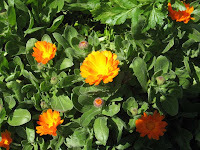 I had some calendulas and ranunculus blooming and I harvested some celery. I don't usually grow celery, but decided to give it a try...hmmm...don't know that I would do it again. It tasted fine, but the snails seem to love it a bit too much. I made a bouquet with the ranunculus and the celery for the greens and it was very nice! Well, in addition to gardening I did some cleaning and reorganizing here at the homestead. I didn't take any pictures of that as I don't find it interesting, but it sure makes me feel good. Then I spent a little time on my first Dresden Plate block. 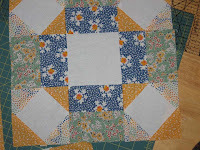 My Grandmother made several quilts using this block so making this made me think of her and her quilts. I don't know how she pieced so many without all the fancy tools I am using to make it easier. This was a really fun block to make. Just picking the fabrics was fun. I have lots of them left so I am going to be making the rest of the blocks from our class with them. The fabrics actually look like some that my Grandmother used which makes it all that much more special. I tried my blind hem stitch for this and like the results except that I need to re-watch the video that Ricky Tims did explaining how to turn the corners, mine are not perfect. 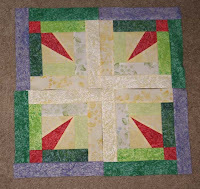 I also read in Eleanors book where I found some shortcuts for this pattern that they used to appliques these blocks with black thread and a button hole stitch. I might make another one because I have the fabric cut to make more and try it with the black button hole stitch. I liked the look of this block so much that I made a photocopy of it and put on my notebook that I am keeping all the information with my current projects. I think it looks kind of fun and I don't think I will loose my notebook! Hope you have a simply perfect day! It has been raining a lot here lately so I have been doing quite a bit of sewing. I have so many different projects in the works that nothing is getting finished. 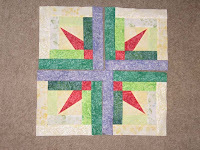 I am taking a quilting class and am working on some blocks for that. The first one I made I wasn't thrilled with so the other day I remade it with different fabrics and made the next 2 blocks for the class. 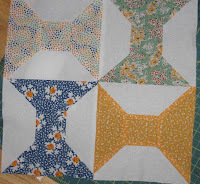 I used some older looking fabrics, but I used all I had on these 3 blocks so now I'm not sure what to use for next ones. I might just make these 3 into a runner or something. I want to start thinking up some projects for useful items. I am loving putting together blocks but, then I don't have any idea what to do with them. Piecing is like putting together a puzzle for me and I love puzzles. Some are more challenging than others. I also love putting colors together and seeing the different looks you can get. 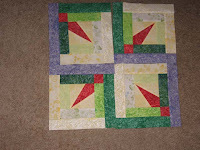 I made these 4 squares after being inspired by something on a quilt show. Then I played around with the different looks you could get by turning them in different directions. I enjoyed playing with them so much that they are still not sewn together. I couldn't decide which way I liked them and since there are only 4 they are not big enough to be a throw or anything. I was thinking that they could be the center of a throw and I could do something around them...more thinking to be done with this, but I have had a lot of fun with it so far. I have a few BOM that I am working on too. 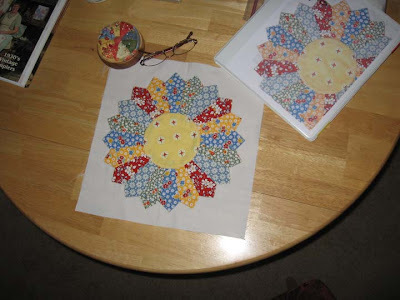 I am doing Bunny Hill's basket blocks with lots of applique. 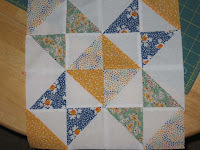 I am not really good at the applique, but getting better with each new block. I am also doing Willowberry's Verandah Views in embroidery. I just printed out the March block and it is really sweet. I love having all the different types of projects because I can never stay focused on one thing for too long or I get bored. 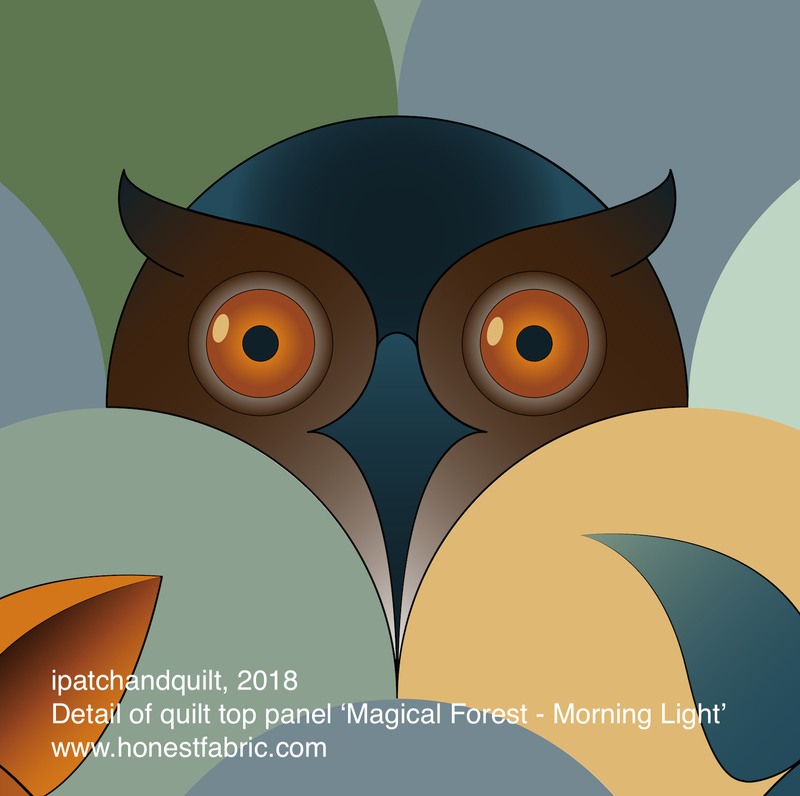 I have been working on The Quilt Shows BOM also, but it is getting really difficult and I keep getting stuck on colors to use in it so it is not moving very fast. The other day I transplanted some of my tomato plants that I am growing in the apartment. They are looking so nice and healthy. 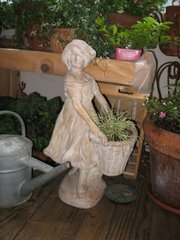 I can't wait to be able to get out and garden again! We just realized that Daylight Savings time starts on Sunday again so I guess that means that Spring is just around the corner. Yea!! !